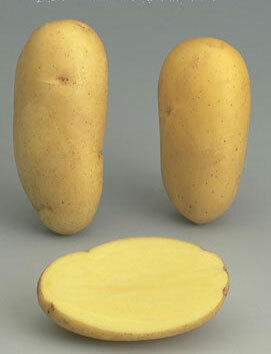 Tuber: Long oval, very regular, shallow eyes, yellow skin, yellow flesh. Sprout: Purplish red, conical, medium hairiness. Plant: Medium height, semi-upright habit, semi-leafy type. Upper: Entrenceuds slightly pigmented, no pigmented knots with developed and straight wings. Leaf: Clear green, moderately divided open; leaflet average, oval (I = 1, 71); limbus plan. Flower: Purplish red, flower bud moderately pigmented. Fruit: Very rare. susceptible. Tuber blight: slightly susceptible. sensitivity to sprouting: Moderately susceptible.